Father Anthony Kathawa, as­sociate pastor of St. Thomas Chaldean Catholic Church has a dual role as a priest. He is also able to celebrate mass and serve in the Latin Rite. Last month, he was sworn in as Chaplain for the Selfridge Air National Guard Base in Harrison Township. Bishop Francis approved the bi-ritual status. Fr. Anthony is a bi-ritual priest through the Military Diocese. With the bi-ritual status, both Fr. Anthony and Fr. Rudy have the approval to cel­ebrate mass in the Latin Rite church. On Sept. 9, Brig. 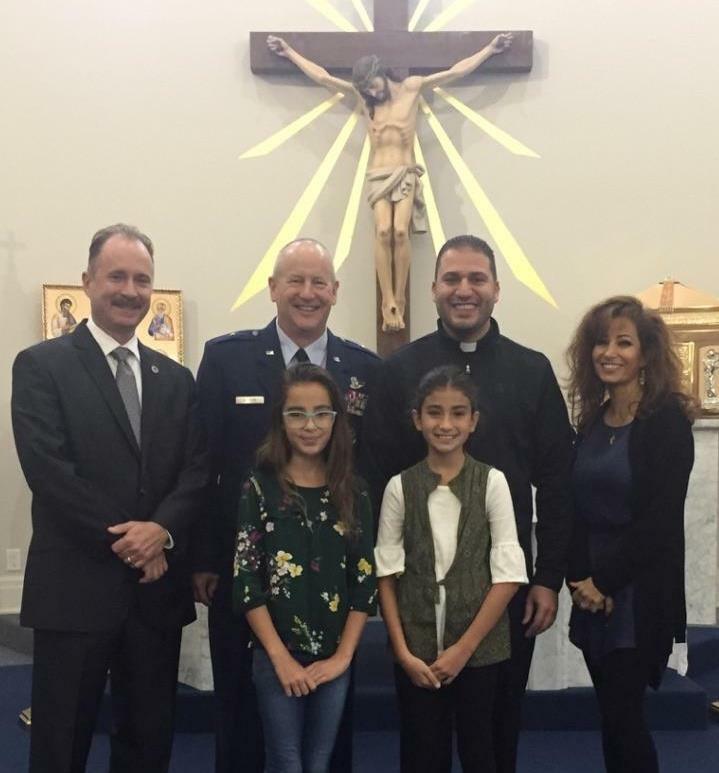 Gen. Doug Slocum, 127th Wing Commander, administered the oath of office to Father Anthony Kathawa at the St. Thomas Chaldean Catholic Church in West Bloomfield Township, Mich.
Fr. Anthony will attend training to become a chaplain with the 127th Wing. He will be among other chap­lains. Fr. Anthony applied for enlist­ment in the Michigan Air National Guard and met the eligibility require­ments for an available Chaplain po­sition. Now that he is a member of the Guard, he will take military and job-specific training so he can com­mission into the Chaplain Corp.
As a Chaplain, he’ll have a key part in the Air National Guard’s ef­fort to help meet the spiritual needs of an exceptional group of highly trained, dedicated service members. Military Chaplains minister wherev­er forces serve, providing a religious ministry response to the needs of service members, families and other authorized personnel whether at home base or deployed. Chaplains participate in religious observances and worship services, spiritual and religious educational materials, con­fidential counseling, grief ministry — grief counseling/support groups and grief management. Once Fr. Anthony completes his initial active duty training in his job field and his officer training course, he will receive his commission in the Chaplain Corps. ; commissions are not time-limited. The mission of the 127th Wing Chaplains are to service the Airmen assigned to the Wing, without regard to denomination. “We are honored to have Fr. Anthony as a member of the military and Team Selfridge. We look forward to his guidance and leadership,” said Brig. Gen. Doug Slocum, 127th Wing Commander. Selfridge has a century-long his­tory in Macomb County and, aside from the command unit, 127th Wing, houses more than 40 tenants from all branches of the military. Marine Re­serve, Navy Reserve, Army National Guard, Active Duty Coast Guard and Customs and Border Patrol all have units stationed there. There are many benefits to joining the Michigan Air National Guard. To learn more about the benefits of joining your your hometown Air Force, visit https://www.127wg.ang. af.mil/Contact-Us/Careers/ or call: 586.239.5511.